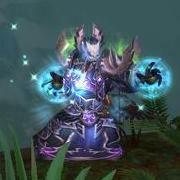 I was digging for a long time trying to find a weakaura that could use a progress bar to track the stacks of a buff instead of the duration. I tweaked the only existing WeakAura I found for use with Incanter's Flow. If anyone has any tweaks (specifically, I don't like how it lingers after the buff disappears) please share! Also, I place this combined group above it. Essentially just the incanter's flow buff icon that glows when it reaches max stacks. Helps to draw my attention briefly to it, as if the progress bar wasn't enough. Also a user of the above listed. Love it. Good suggestion there Woofi!